Get your glam on with the Touch Ups Cassidy Viviana wedge-heeled sandal. This eye-catching women's sandal is crafted with a metallic faux leather upper; glitter fabric wraps the heel and platform for extra dazzle. An adjustable strap adds enhanced fit, while a lightly padded footbed softens every step you take in the Touch Ups Viviana high-heeled sandal. Fit tip: This shoe fits true to size. The Viviana from Touch Ups brings big glamour to your chic little dress. 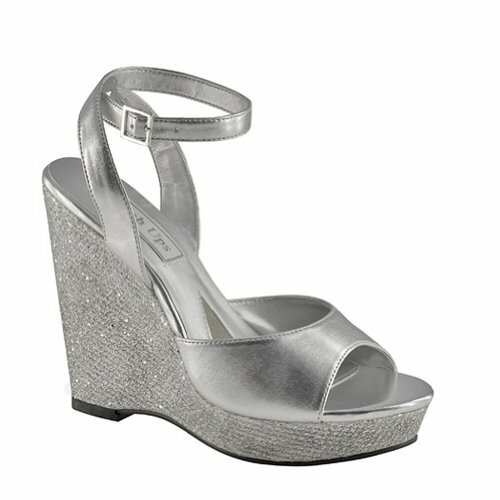 This dazzling shoe features a simply styled, shiny metallic upper with a cool, wrap-around ankle strap design. The real wow comes from the towering platform wedge heel that's covered in eye-popping glitter making this shoe a real stand-out.